A little anecdote about truffles. The common truffle grows entirely underground and it is sometimes called ground mushroom. There are several kinds, but the eatable one in some degree resembles an ill-shaped potato and varies in size, from that of a hazelnut to the bigness of a moderate-sized fist. Before it is ripe, it has merely an earthy smell, but when becoming mature, it diffuses a peculiar odor, very pleasant to many. The truffle is rare in most countries. It is eaten plain, boiled or roasted, but it is a much sought after as an article of luxury. It is used in the more luxurious kinds of cookery to give a flavour to sauces, and a turkey stuffed with truffles, so that the flavour may be dispersed throughout the meat, is one of the great delicacies of the French kitchen. ....The truffle is usually found under trees in open-forest grounds, and in plantations of deciduous trees. It requires to grow in a place shaded from the sun, and in light loamy soil. When they become ripe, which is about the end of August or the beginning of September, their strong odour is diffused. Truffles sometimes appear almost out of the ground; their usual depth below the surface is two or three inches. Dogs are taught to hunt them by th odour, and then scratch them up. The Poodle or French Barbet are usually selected for this purpose. BOTH kinds have a good nose, are docile, and have another special merit, for not having a strong instinct for following game, they are not taken off their pursuit of the truffle by the starting of a hare, or the rising of a pheasant or a partridge. 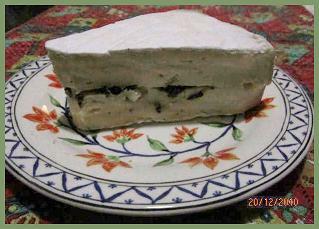 Take a nice slice of Brie. (You can even tell your friends your Barbet found the truffle....) I was given a few little ones that I had frozen for a special occasion! Those of you who know me know how much I love nice dishes...nice dishes! PS: I am also a major factory store shopper...so my Gien comes from the factory because, yes, it is a tad bit expensive. But. Quaciendas Chouffe; read more about him! I'd like to thank my friends at Authentic Barbet for helping me select the best mate for my Coccolian. Nothing like a bit of teamwork.......! It is most appreciated. Joseph Ortega est une réference pour les questions d'obéissance canine et bien d'autres choses où il donne son avis et ses conseils. Pour ce qui est du "handling"? En France? Les juges aiment les chiens très toilettés qu'on soulève d'un bloc de la table de toilettage et qu'on pose au sol. Les handlers ont souvent la brosse dans la poche arrière...lisez la suite! Donc, là je ne suis pas très d'accord avec lui, mais bon.On en reparle. Barbara Woodhouse a dog trainer in the 80's ( just look her up on Google) was wonderful. Nothing else to say about her. A Barbet needs to be trained or he will take over. You are dealing with a very intelligent dog who wants to please YOU! Now, if I can handle 8 dogs( of which 3 males), do photo shoots, go to hotels and travel with them....then others can, too. My dogs are polite and well-behaved. I love them, they know it and they all have their place. Often, anthropomophism takes over and then it all goes to pot. Happy Holidays from all of us at Barbets en Bresse to all of you! 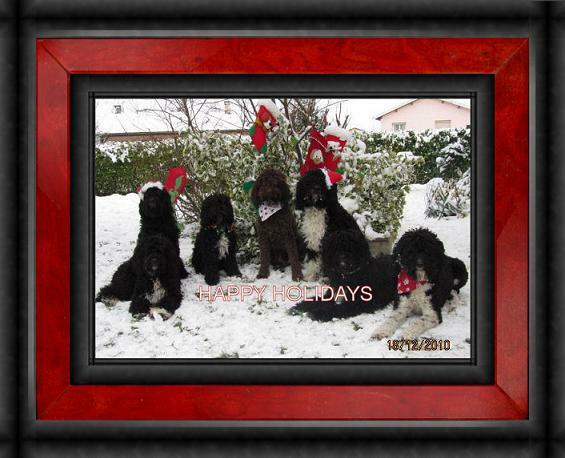 From left to right: French Lover Dog, Thelma la Douce, Coccolina, Booly Wooly aka Guyguy, Compay II, Floirac Déjà Vue, Vera. These people are absolutely not resting on their laurels...!